We just hung this fabulous chandelier in the showroom ~ isn't it terrific?! I've always thought this would be the perfect piece for a contemporary foyer. 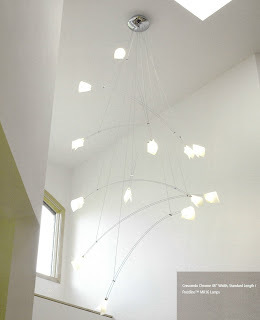 It has 7 free-floating arms suspended by aerial cable, each tipped on both ends with frosted lamps and white flight paper. So unique!